The next step is to calculate your storage needs to help build the appropriate volume. If you are building a multiple bay system (strongly recommended), you will need to decide the appropriate size for each bin. There are helpful example calculations below as well as an interactive calculator for your convenience. In order to effectively store your horse manure compost you need to be able to determine the approximate sizing of your manure bins. The following calculations are from the BC Environmental Farm Plan and should give you a good idea of how large your system needs to be. These are general guidelines to follow and are over-estimated in order to compensate for bedding material added to the system. You know your property better than anyone and can decide for yourself what the most appropriate measurements will be for your system. Most important is to remember it is better to overestimate the amount of volume needed than to underestimate it. 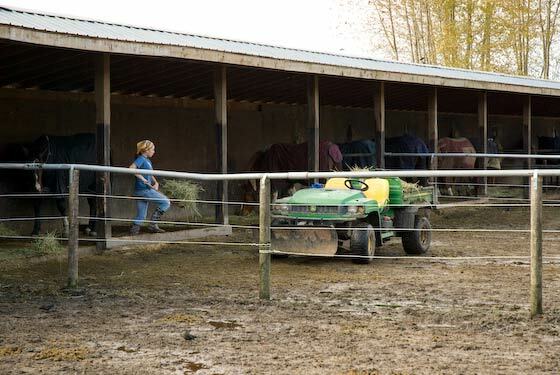 Leaving extra room to allow for turning will make managing your manure much easier. You may also consider building your system in a location on your property where you can expand the system if needed. You may have already determined this in Step 1. *Freeboard safety: this step in the calculation process is to ensure that the calculated storage length allows for the appropriate volume to be contained while allowing for space between the top of the pile and the top of your system. Here are some example size calculations. For a horse property with 5 horses and 6 months of storage required (in metres). For a horse property with 5 horses removing 4 wheelbarrow loads per day and 6 months of storage required (in feet).